Quesada was speaking in a panel discussion at the 2019 Global Mission Conference that his diocese co-hosted with the Dominican Development Group, April 3-5, in Boca Chica, Dominican Republic. Organized by the Global Episcopal Mission Network (GEMN), 120 people from all over The Episcopal Church were wrestling with the role of evangelism in the church’s global mission under the theme, “Sharing Jesus: Mutual Witness in Global Mission.” The bilingual conference included simultaneous interpretation between Spanish and English. “People in South Carolina often say they are ‘highly favored,’” said Bishop William Skilton, former suffragan of the Diocese of South Carolina. “Part of our problem as a church is that we have stopped at being favored, and we haven’t tried being the flavor – the salt. You’ve forgotten your calling to become fishers of people and you’ve become aquarium keepers.” The mission conference was held at the Dominican diocese’s Bishop Skilton Conference Center, named in honor of his service as a missionary and, later, assistant bishop on the Caribbean island. In addition to plenaries by keynoters Delgado and Spellers, an array of 18 workshops addressed outreach to under-evangelized people, gospel enculturation, the history of Anglican evangelism, digital evangelism, “The Way of Love” in global mission, missional encounter with Islam, mission and community at the upcoming Lambeth Conference in 2020, locally empowered economic mission, asset-based community development, interfaith reconciliation, Hispanic evangelism, missionary vocational discernment, and site-specific discussions of mission in the Sudans, Cuba and the Dominican Republic. The Rev. David Copley, director of the global partnerships unit at The Episcopal Church Center, updated conferees on the work of that group. The conference concluded with visits to congregational and medical mission sites on the island. 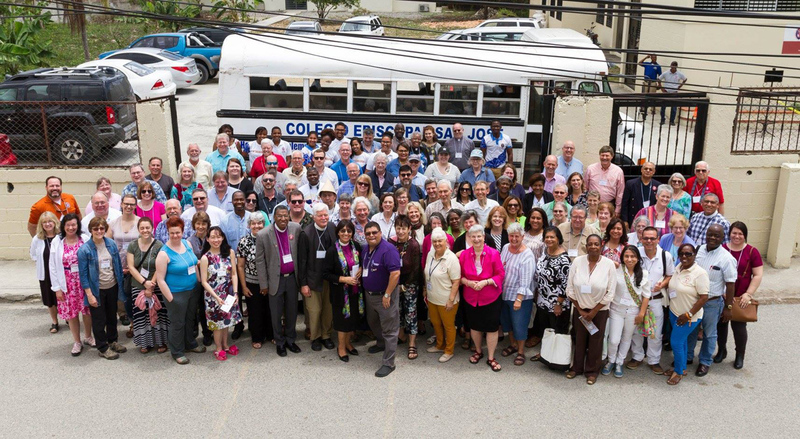 Patrons of conference receptions were Bexley Seabury Seminary, the Diocese of Connecticut and the Dominican Development Group. GEMN’s Mission Formation Program preceded the conference, this year enrolling a record 14 participants to spend a day exploring biblical foundations, mission theology, cultural dynamics and the practicalities of catalyzing mission vision and mutuality with companions around the world. The four participants graduating from the two-year program shared their projects: field research on indigenous religious rites in the Philippines; work on GEMN’s curriculum based on “The Way of Love”; exploring ways of enabling Honduran women to economically manage their monthly cycles without missing school or work; and a memoir about working in GEMN since its inception in 1994.